Practically every kid loves to play on a swing set, whether they swing up high or climb on the monkey bars. Having a swing set installed in your backyard or neighbor recreation area can create a fun place for kids to play and burn off excess energy. In many cases, you can find an affordable swing set that will last your family many years. We reviewed dozens of swing sets, from the inexpensive to top premium models, to identify the best swing sets available online. We examined customer reviews, safety features, and construction materials to see which swing sets were the best. We wanted to find the swing sets you’ll feel confident about and that your kids will love. The Lifetime Monkey Bar Adventure Swing Set with 9 Foot Wavy Slide stood out as the clear choice for our top pick. With hundreds of positive reviews from customers and enough room for multiple children to swing at once, it is an excellent choice for backyards and childcare centers alike. The Lifetime Monkey Bar Adventure Swing Set with 9 Foot Wavy Slide is an extremely popular swing set that’s easy to install in your backyard or childcare facility. It has enough room for many kids to play at once, with three swings, a trapeze bar, wavy slide, monkey bars, and a fireman’s pole. It comes with a 5 year limited warranty so you can feel very confident that your swing set will last. It is as turnkey as a swing set can get with no need to stain or paint the swing set before use. It is free-standing and does not require you to put a concrete anchor into the ground. This means that if you later decide to remove the swing set when your children have outgrown it, you’ll be able to do so easily. It is constructed of an all-weather high strength alloy steel that will not be damaged over time. It won’t peel, warp, or rot like wooden playsets might. It has been designed for maximum safety, with rounded hard edges and soft rubber grips located on the swing chains. The Lifetime Heavy Duty A-Frame Metal Swing Set is a solid choice for a backyard swing set that will fit in most backyards. It is a classic A-frame metal swing set that is free-standing, so it doesn’t need to be permanently installed with concrete or anchors. It features two belt swings and one trapeze bar to offer a little variety. It is made from all-weather high strength low alloy steel that is durable with special design considerations to promote safety, such as plastic caps over hard edges and soft rubber grips for swing chains. 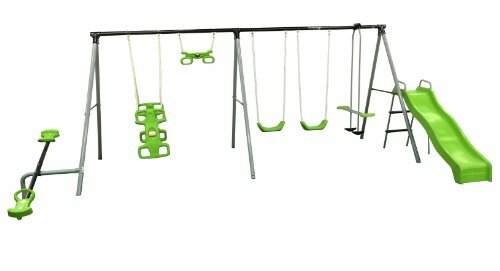 Although the FITNESS REALITY KIDS ‘the Ultimate’ 8 Station Sports Series Metal Swing Set is a budget friendly model that will cost you less than $300 to buy, this model stood out as an overall excellent choice with unique features that promote exercise for kids. It features 8 distinctive activity stations that 9 kids can play with at the same time. In addition to a regular swing, there is a trampoline, flying saucer, glider, monkey bar, basketball hoop and a soccer goal. The swing set is constructed of 2 inch powder coated tubular steel and can accommodate up to 80 pounds per seat. It meets the ASTM and Consumer Product Safety Improvement Act Standards. The Flexible Flyer “World Of Fun” Swing Set is an excellent backyard choice that’s colorful and full of fun options for kids to explore. It has a seesaw, slide, and a trapeze bar in addition to several variations to swing on. It has a weight restriction of 105 pounds per seat and can accommodate up to 10 kids. It has seated, hanging, tandem, and a horse swing options, as well as a slide and a seesaw. The frame is metal and features six supports for stability. The black, green, and gray color scheme adds a new level of excitement and uniqueness. This swing set is made in the United States. It comes with a 180 day limited warranty that covers any manufacturers defects. Additionally, its powder coat painted frame will hold up well over the years and keep it looking new. For a premium wood option, the Swing-N-Slide Grandview Twist Play Set with Two Slides, Two Swings, Monkey Bars, Glider and Climbing Wall is an excellent choice that looks great. Swing-N-Slide has a wide range of options for you to choose from. However, this model is the best because it features two slides, a climbing wall, clubhouse, and monkey bars. Swing-N-Slide is known for its patented bracket system that makes installation much easier. It meets ASTM safety standards for residential use and comes with the ground anchors you need to install it. Buying a swing set can be a serious investment, depending on the price and installation requirements. However, if you’re the parent, grandparent, or aunt of elementary-aged children, you can transform your backyard into a fun play area with a swing set. There are many options, from the small and simple to large, premium models, so you’ll be able to find a swing set that fits your space and budget constraints. Schools, daycares, and homeowners associations can also benefit from purchasing a swing set for recreation areas, parks, and playgrounds. If your facility does not currently own a swing set, one of these options can be easily purchased online for a relatively low price. It’s a highly effective way to add value to your neighborhood or educational program that adds fun and exercise opportunities for kids. Construction materials. When it comes to swing sets, construction materials matter. Wood swing sets are lighter weight than metal swing sets and provide a softer surface for kids to play on. Metal is sturdy, but it can rust over time. Some swing sets are even made from plastic composites. Trapeze swing. With a trapeze swing, kids hold onto the triangularly shaped bars and swing from their arms. Canopy. A canopy can provide some shade to the swing set, especially those with second stories. Rock climbing wall. Mini rock climbing walls provide kids with a fun way to climb up into the play area. High strength steel swing brackets. High strength steel swing brackets ensure that the swing set won’t come apart while kids swing. Weight capacity. Depending on the size of your children, whether adults want to play on the swing set, and how many kids you expect to play on the swing set at the same time, you’ll need to find a swing set with a weight capacity that will work for your specific needs. Generally, the higher the weight capacity the better. You don’t want to ever put more weight on a swing set than it is rated for. Two stories. Two story swing sets can be a lot of fun for kids, though a second story does make the entire play structure taller. ASTM compliance. ASTM International is an international organization that sets out standards for toys and other products. In the United States, all toys must meet the safety requirements set out in ASTM F963. Infant swing. Infants who are unable to sit upright on a traditional swing can use an infant swing, which typically has a bucket seat with safety restraints. Number of swings. Some models have a single swing while others have five swings or other activities to choose from. Height adjustable slides. Models with height adjustable slides will grow with your kids, as you can increase how tall the slide is when you need to. What is the best thing to put under a swing set? Although you’ll find grass underneath many backyard swing sets, grass does not provide much protection in the event of a fall. Many swing sets use wood chips, mulch, rubber mulch, sand, or pea gravel underneath to provide a little protection against falls. However, no substrate can guarantee that your child will not be injured during a fall. Having enough of the substrate down can help. Each material has its own advantages and disadvantages. Wood chips or mulch is an inexpensive option that could cause splinters. Rubber mulch is more expensive and flammable, though it does provide a softer surface. How do you anchor a swing set? According to wikiHow, there are three ways to anchor a swing set: concrete anchoring, one-piece solid ground anchoring, and two-piece solid ground anchoring. Concrete anchoring is a permanent option that requires concrete to be poured into the ground. Ground anchoring requires hard ground or an area covered by very dense grass. You’ll simply need to use a twist-in anchor for the swing set. How high off the ground should a swing be? According to the United States Consumer Product Safety Commission, there are specific guidelines to follow when installing playground equipment, such as swing sets, depending on how old the children are that will use it. For preschool aged kids, it is recommended that there is at least 12 inches from the ground. For school age children, it is at least 16 inches. How far does a swing set need to be from a fence? You’ll want to install your swing set where there is ample space to prevent injuries and provide kids with a safe place to play. At a minimum, you must have at least six feet between the swing and a fence or wall. However, you’ll need to take into consideration the height of the swing and the chains that connect it to ensure that six feet is enough. We looked at 20 other swing sets. Even though they didn’t make our 5 best swing sets list, they’re the best of the rest and each is still a great option for your kids. The information you’ll need to compare each one is included with the listing. This Backyard Discovery Prairie Ridge All Cedar Wood Playset Swing Set adds more than just swings to your backyard. It includes a second story fort with an attached slide, a sandbox that holds up to 350 pounds of sand, and a set of monkey bars. That way, there are plenty of things for your kids to do than just swing. The all wood construction is durable and weather resistant. The Big Backyard Andorra Swing Set Playset has a medium-sized footprint, which fits easily into smaller yards. There are two swings spaced further apart for added safety. You also get a covered fort area with an attached slide. It is built out of solid wood that is both durable and weatherproof. For more advanced swingers, the is the Flexible Flyer Fun Fantastic II Swing Set. It has five swings with two regular swings, one sitting/standing swing, one handing swing, and one tandem swing. There is also a slide on one end and a seesaw on the other. The frame is made out of metal for extra durability, and it is powder-coated to be weatherproof. For a smaller option, you can go with the Flexible Flyer Outside Fun II Swing Set. It is a smaller version of the Flexible Flyer Fun Fantastic II Swing Set with three swings and a small slide, making it a better option for smaller children. The four-leg design keeps it stable and a powder-coated metal frame withstands high weight limits and weather. This set also includes a set of ground anchors. Lower height for smaller children. This Ironkids Kids Outdoor Playground gives you different options than most swing sets. It comes with a detachable trampoline and slide, as well as three swings with two type options. The center swing is designed for hanging, and all three swings are spaced far apart for safety. The set also has a canopy over the swings for added protection during the day. This Step2 Naturally Playful Playhouse Climber & Swing Set Extension gives you a combination between a swingset and a fort. It has a second-floor slide included. The entire frame is made out of highly-durable plastic, which is corrosion resistant and lightweight. The frame uses a fully braced A-frame to improve stability despite its lower weight. If you like themes, this XDP Recreation “Freedom” Swing Set has a patriotic red, white, and blue theme. It gives you several swing options including seated, tandem, and a swing shell options. There is also a short slide attached for added variety. This set is ASTM and CPSIA compliant and can fit up to six kids at once. The Flexible Flyer Deluxe Trapeze Swing Big Adventure Metal Swing Set has a metal and plastic construction that lets it expand to hold more kids at once. It can hold up to seven kids at the same time. There are seated, standing, hanging, and a horse swing available. A slide and two-person seesaw are also included for added variety. If you need a strong but small swing set, then try the Flexible Flyer Fun Time Metal Swing Set. The frame is made out of steel, which makes it strong and weather resistant. The chains are all covered in HDPE plastics (vinyl) which protects them from the weather and protects swingers’ hands from snags and cuts. The set can hold up to 650 pounds and six kids at one time. This Flexible Flyer Play Park Swing Set features a durable steel A-frame. The set is powder coated in an attractive ivory, maroon, and mocha finish to protect it from the elements. It includes seated and hanging swing options as well as a gondola-style swing seat that can hold 2-4 (if small) swingers. The chains on all of the swings are height adjustable and covered in vinyl to protect swingers’ hands. For a simple and portable option, choose the Movement God Metal A-Frame Two Seat Swing Set. It is made out of steel components and collapses into an easily-manageable set of pieces that is easy to transport and reassemble. It includes two swing seats. This swing set looks different from most sets with a deep blue color and bright green and orange swings. It fits children up to eight years old. Few swing sets are designed for children as well as adults, but the Sportspower Spring Breeze Me & My Toddler Swing Set lets you swing with your kids. The tandem swing is double braced and adjusted so that one adult can swing with one kid. The entire frame is constructed of 2-inch steel tubes that are resistant to weather and wear. The chains are height adjustable for a better fit. If you have the space for a large swing set, then you can get the Backyard Discovery Skyfort II All Cedar Wood Swing Set. It is an extra large set with swings, an attached two-story fort, a slide, a climbing wall, and monkey bars. The set is built of thick cedar planks and beams for added stability as well as a lasting finish that is pretreated to be weather-resistant. 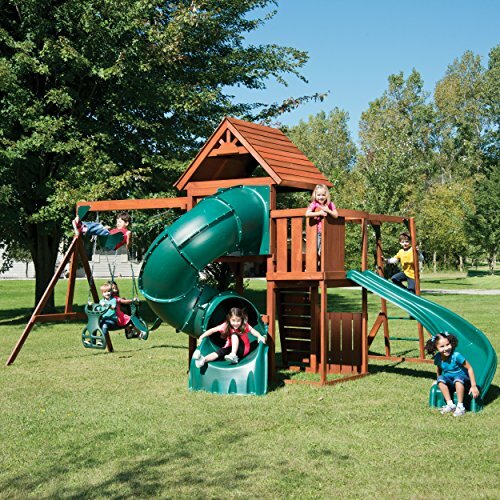 One of the larger options that you can choose is the Backyard Discovery Woodridge II All Cedar Wood Playset Swing Set. It is built of cedar that will last many years out in the open weather. In addition to swings, it has an observation deck, an observation tower, a covered crawlway, a covered clubhouse and multiple climbing elements. 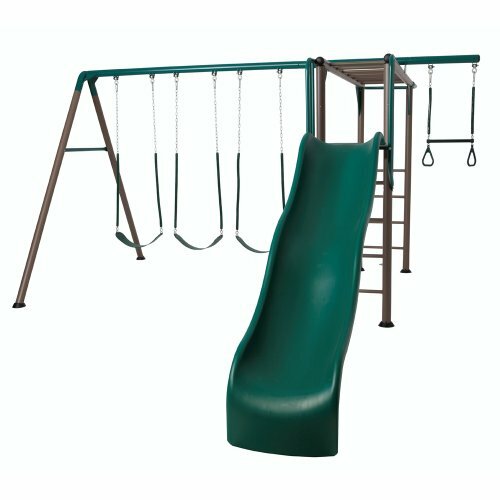 The attached slide is 10-feet long with a wavy design to control slide speeds for safety. This Skroutz Metal Swing Set offers a lot of options for kids to play on. Up to eight kids at a time can play on it using a variety of swings including a roman glider and a flying saucer. There is an attached slide as well. The entire frame is made out of a solid metal tube that can withstand inclement weather. If you like the cedar swing sets but want a smaller one, try the Backyard Discovery Dayton All Cedar Wood Playset Swing Set. It is built of cedar and durable plastics that are weather resisted. It is also lower than other cedar sets making it a safer option for smaller children. The Backyard Discovery Montpelier All Cedar Wood Playset Swing Set is a popular option with a different shape that takes up less space in your backyard. It has a distinctive T-shape with the swings, slide, and monkey bars forming the arms. In the center is a two-story fort and clubhouse that are covered for added sun protection. You can get the Backyard Discovery Tucson All Cedar Wood Playset Swing Set for a smaller inline design that takes up less space and fits along fences and other boundaries easily. It has an attached bench where kids can take a break. There is also a two-tone slide attached for added fun. 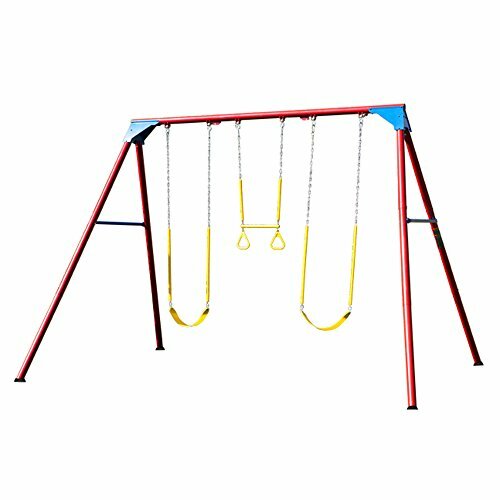 The swings are made out of molded plastic for durability and flexibility. If you have a small space, then try the Backyard Discovery Weston All Cedar Wood Playset Swing Set. It has an L-shape the makes it easier to fit in the corner of your yard. Overall, it is a smaller option than many others, making it easier to assemble and put in place. Its joints are reinforced with durable, weather-resistant plastic. The Step2/Backyard Discovery Edgewood Cedar Wooden Swing Set Playset has a covered lower deck that is great for getting out of the sun and a covered upper deck while waiting to go down the slide. The swing chains are adjustable for a better fit, and there is a two-person glider included for added fun. If your kids want to eat outside, there is a picnic table included.